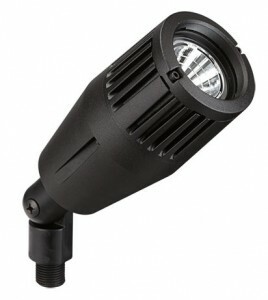 Vista’s 3100 Series fixtures are durable landscape lights available in four low voltage models, each ready to install with factory-fitted integrated high-density array (HDA) LEDs delivering comparable light levels in the 20W to 50W halogen range (400 to 700 lumens) with wattages ranging from 4.5W to 13W. Configured with precision optics, integral drivers and constructed of die-cast aluminum, all models are dimmable. Mounting options include ground stake, tree or canopy. Select from 16 polyester powder coat finish options, four beam spreads and three-color temperatures. Multiple shroud options are available to create desired level of beam and glare control.